Part of being a migrant is developing your own rituals, blended from your country of origin and your new home. That holds true even for privileged migrants like me – privileged in the sense of an easy transition between two similar countries speaking the same language. So last weekend, a long weekend in Victoria to celebrate the AFL grand final, which happens to be the weekend before Canadian Thanksgiving, my family celebrated our own version. The only rule everyone insisted on was that there had to be pumpkin pie. And of course I used the recipe my mother wrote out for me in the handmade recipe book she gave me when I got married. The picture I posted on Facebook got so much reaction from my Australian friends that I agreed to post the recipe. I think it was originally adapted from Better Homes & Gardens. Lower heat to 325’F or 165 C for 50 minutes. 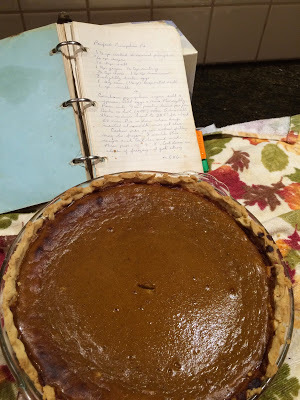 Pie is done when knife inserted at centre comes out clean.